I use oats in some IPAs comes out good. Never done a straight no chill but often do a short chill and then just let it cool off in the fermenter. How will you proceed with your chill? I will be chilling the wort in a 5 Gallon Plastic (HDPE) until room temperature. Transfer it to my carboy and pitch the yeast. My only comment is that I like to use a bittering hop charge even when doing FWH. I know it's a PA not an IPA but I'm not sure you'll get the bittering you want from only FWH. What do you recommend. I dont want a harsh bitter taste. That is why I want to FWH and ended with some hops at whirlpool for 20 min. Is one of those additions a whirlpool addition? Both say FWH and the other 30 mins. You want to add some later than 10 mins for some aroma. My apologize the screen shot I took was of an earlier formulation I was coming to. However what I am thinking is doing a FWH and a whirpool. I need some help to reach my goal of 40sIBU. I dont want this beer to be too bitter but I do want a big hop aroma. I don't like really bitter beers myself. My IPAs are first and foremost about aroma. Some are bittered just enough to balance them some others have more bite and dryness. I like magnum as a bittering hop because it's a high AA hop so you don't need a lot and it's a clean bitterness. For a pale ale I'd shoot for something like 20-24 IBU from my bittering hops just for balance. IMHO FWH give you more flavor so I always use bittering hops with FWH. The PA I'm drinking right now is a lot like a Firestone Walker Union Jack. I did centennial FWH for 16 IBU, then bittered with magnum to almost 25 IBU. Then I did 14 IBU at 5 mins and 3oz DH. It's 55 total IBU which is high for a PA per style but its really smooth and balanced with lots of juicy hop flavor and aroma. I've been late hopbursting more lately instead of whirlpooling. I think whirlpooling gives great aroma early on but I don't think it's as stable as the late hopbursting which seems to create aroma that lasts longer in the keg. Just my opinion YMMV. Thank you for your opinion Dannyboy58. I actually saw a video on Youtube about some guy using magnun for his no chill IPA mainly for bittering. He kind of said exactly what you said about the taste and feel. Do you care to write the hop schedule and the amount of hots I should use for a better understanding. BS2 is estimating it at 1.060. The space showing 1.046 is where you input your measured OG and since it's highlighted in yellow means that it's an old value left in there that needs to be uptdated. 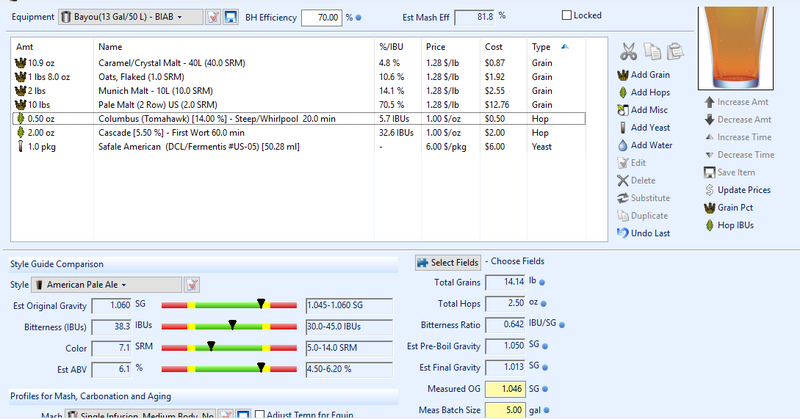 Beersmith using higher higher brew house efficiency and it came out at around the same OG. I am shooting for 6%ABV lets see what happens. By the way I brew in a bag, no sparge, 60 min mash. Yes I been giving a lot of thought to this and read a lot of of articles in the past couple of hours. This is what I came up with. Still no late hops? I really think you'll want to add some additions with less than 10 minutes in the boil. My late hops addition are moved to FWH. Im doing a no chill method. Is there a commercial beer that you would use as comparison to what you're hoping to brew? I'm just curious. Also know I'm not trying to change your mind about what you want to brew. It's your beer and it may turn out just exactly as you anticipate but since you asked for opinions...we got plenty of em around here. In my experience entering FWH as a 60 minute addition in BS2 is going to over estimate the perceived bitterness. The beer will taste less bitter to the tongue than a 60 minute addition of the same size. Here's a good thread on FWH from a couple years ago. Lot's of opinions. My experience wtih FWH has been pretty much in line with what @denny describes regarding perceived bitterness. Some guys disagree. We all taste things differently so you have to brew to your tastes. Hello dannyboy58 I read the posts really interesting stuff there, good argument. I think I will you just try the hops schedule and see how it goes. Trial and error. 1oz citra dry hop the last 5 days of fermentation. Go for it man. Let us know how it turns out. 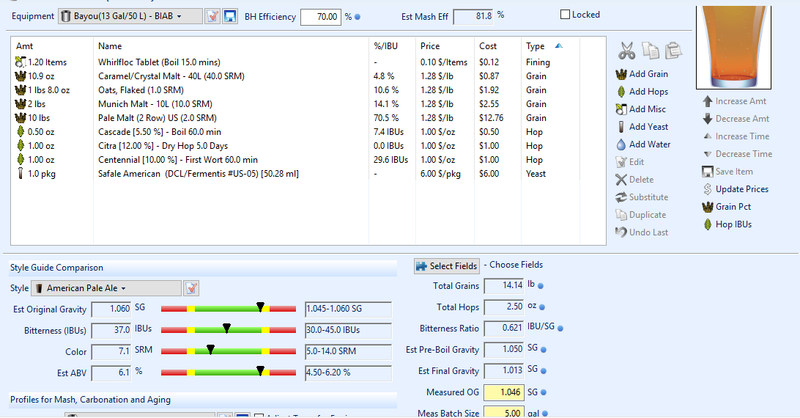 In the experiment I did, FWH actually measured 10% more IBU than an equal 60 min. addition, but most tasters thought the FWH beer tasted less bitter. I count it the same as a 20 min. addition and that works for my tastes.